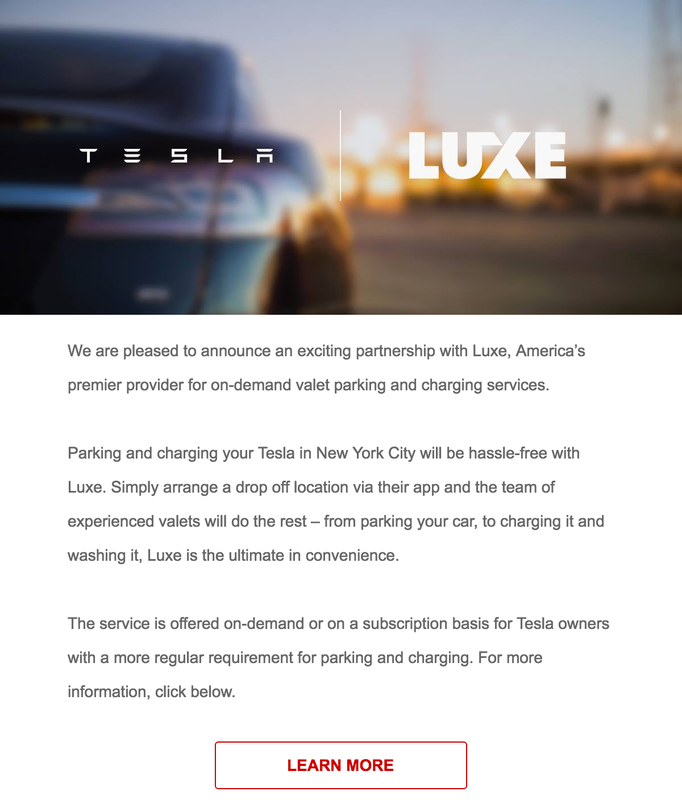 After launching a pilot program to test Luxe’s on-demand valet parking and charging services with its vehicles earlier this year, Tesla now officially announced the partnership to its owners in the first few cities where it’s available: New York and San Francisco. The new program addresses two different problems: electric vehicle charging in cities, which is obviously specific to electric vehicle owners, and parking in cities, which on the other hand is a problem for a lot of car owners – electric or not. The service lets you request a valet on-demand from Luxe’s app. A valet will come pick up your Tesla and park it at a designated charging station. You can request additional services such as a car wash and even leave the car overnight or select to have a driver pick you up and drive you home in your car in case you are not able to drive yourself. Your car will be returned to you when you are ready. You simply request it through the app, ideally 20-30 minutes before you require it. The charging option requires you to park your car for a minimum of 5-hour and adds $15 to the cost of Luxe’s regular service, which varies depending on your location and the duration of the stay. The service is called ‘Tesla EV Charge’ and can also be purchased in bundles to reduce the cost. The other side of the program directly addresses the problem of owning an electric vehicle in cities where parking even at home can be a problem. Luxe offers “Tesla Subscription” services, which are based on a monthly fee instead of the ‘à la carte’ services described above. It’s not cheap, but so is parking in New York and San Francisco – where the services are offered right now. Starting from $499 per month in New York and $399 in San Francisco, you can get access to a Luxe parking spot with a designated ‘Tesla Wall Connector’.